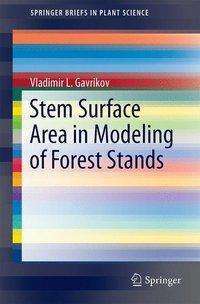 Der Artikel Vladimir L Gavrikov: Stem Surface Area in Modeling of Forest Stands wurde in den Warenkorb gelegt. This book reveals the benefits of describing and modeling trees as the combined surface areas of their stems, and provides a concise overview of the fundamental grounds for adopting such an approach. Anatomically speaking, trees are largely thin sheaths of living cells and it is this understanding that has sparked growing interest in the study of stem surface areas in trees and stands. An overview of publications on analytical methods for the dynamics and structure of forest stands based on stem surface area is also provided. The approach described here gives readers a chance to rethink some models that were popular for decades, while also offering a glance into future research. The application of a simple geometrical model of a forest stand has made it possible to reexamine a highly promising model, the self-thinning rule, which has been a subject of a protracted discussion for the past few decades. Further, the analysis presented here can serve as the basis for predicting forest stand increments, a topic that calls for further development.